The campaign for the Saatchi Bill has been, at its heart, an advertising campaign. And, as we shall see, it has been an extremely successful one. If there are awards for this sort of campaigning, the bill team deserve one, because they have been very adept at generating a perception of the bill that is entirely removed from reality, and in giving the apparent impression of having overwhelming support. Some of the statements made by supporters of the Bill (although not by the Department of Health) during the consultation period were misleading but received much publicity. 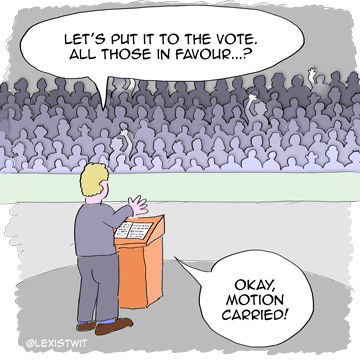 While Lord Saatchi and his bill team have come in for much criticism for making claims that are variously misleading, incorrect or contradictory, in this article I want to look at one particular area, the public consultation. What I will show you is that the actions of the Saatchi Bill team had the effect of undermining the official Department of Health consultation on their own bill in a number of ways. Firstly, by adding a feedback web page and petition of their own and promoting this ahead of the official consultation routes. Secondly, by not waiting for the results of the official consultation before proceeding to drive the bill through the House of Lords. And thirdly, by giving the impression that their petition and web page were the official consultation, thereby reducing the impact o the official results. Along the way, we will see just how much influence PR spin can have on how people answer questions, and how it is possible to manage a consultation to make the results appear to say what you want them to say. To you and me, the purpose of a consultation is to consult – to seek advice and guidance from interested parties, and to use that advice to shape your plans. This is not how the people behind the Medical Innovation Bill (the Saatchi Bill) see consultation. To them, consultation is a means by which you get as many people as possible to answer your questions the way you want them answered. 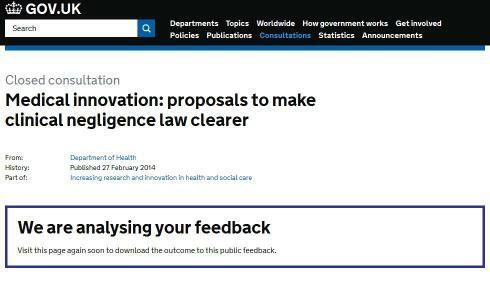 When the Department of Health launched its consultation into the Saatchi Bill, they put up a web page with documents to explain what they were doing. The draft bill was there for you to read, clearly signposted, in a document on its own, with notes available in a separate file. These notes were neutral in character, albeit focussing more on rising costs of medical negligence litigation (arguably a different issue) than on whether the bill would result in a cure for cancer. People could respond via the DoH website or by completing a questionnaire. This asked a series of questions about aspects of the bill before finishing with the question “Overall, should the draft bill become law?” In this way, the respondent was prompted to think about the bill, its implications and implementation before being asked to give an answer. The completed questionnaire could be returned by e-mail or post. Unfortunately, the Saatchi Bill team didn’t leave it at that. So they launched an extensive media campaign, not just to publicise the bill but to get the message across to the public about what they claimed the bill would achieve. Many – possibly most – people would have found out about the bill through advance campaigning via patient and charity groups, via articles in such places as the Daily Telegraph, and via the bill’s busy promotion on social media such as Facebook and Twitter. The bill had its own Twitter feed, its own Facebook page, a website (later expanded to two sites), and a nominated “media partner” in the form of the Daily Telegraph. Promotion of the bill was misleading from the outset. It was not mentioned that Dominic Nutt, when writing in glowing terms about the bill in the Telegraph, was the bill’s Communications Director, nor that the Telegraph was the bill’s media partner. If you write an “advertorial” about a product in a newspaper or magazine, you are required to label it as an “advertising feature”. Not so, it seems, if you are advertising a parliamentary bill, where behaviour bordering on astroturfing appears to be considered acceptable practice. I intend to cure cancer, you see. I mean to do it. I expect to do it. This is the front cover of the guide the bill team produced in advance of the consultation. This is really quite astonishingly nasty stuff. These descriptions given are not correct, as the organisations opposed to the bill have pointed out, but on we go. Many people would have become aware of the bill by reading the Telegraph article or the social media campaign, and followed the links provided to “respond to the consultation”, which took them to the Saatchi Bill page on tumblr. 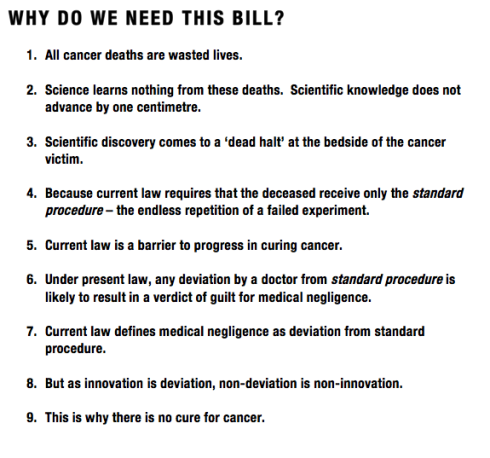 This page is no longer the same as it was when the consultation was running, but looking at it now one can see the same sorts of themes – this bill solves cancer, it allows doctors to carry out more than failed standard care. So a respondent coming via this route would have had the opportunity to answer the yes/no question “Do you want this bill to become law?” and add a comment as to why it was important to them. This response would then, according to the website, be sent off to the DoH on their behalf. I’m going to leave to one side that this process is a little bit like saying “If you’re not happy with your waiter, tell the waiter, and he will tell his boss all about your complaint.” Because there are bigger problems. Anybody wanting to read a copy of the bill itself would not have found it an easy task. At time of writing, you can still try this for yourself – try to find a copy of the bill text on their tumblr page. It was included in their briefing document, so if the reader was prepared to take 102 pages of hard sell along with the two pages of the bill, they could access it that way. There was no easy way to see it without the accompanying spin. The web form was embedded on our own website, The Telegraph online and was hosted on the website of numerous patient groups, rare disease charities and supportive individuals. …so it would appear to have had a wide distribution. The other possible “Saatchi” approach was to sign a change.org petition the campaign was simultaneously running. 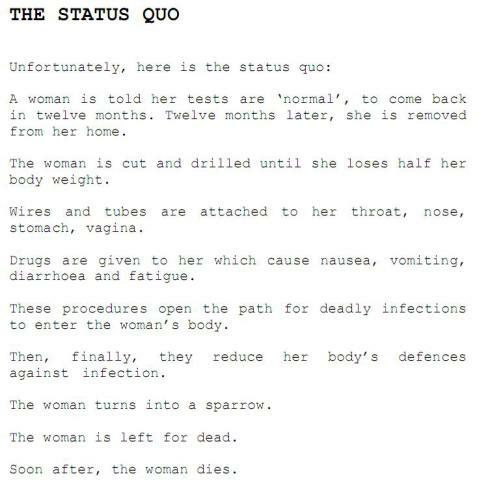 Again, this uses highly emotive language to get its point across. This site didn’t have a copy of the bill, or any link to the bill at all. So here’s the problem. It’s entirely possible, indeed probable, that a reader could get to the point of signing the petition or completing the Saatchi web form without ever once having read the bill itself. The bill is not easy to locate on the Saatchi bill’s campaign page, one is obliged to wade through a lot of bill-positive spin to reach it, and it’s not on the change.org petition page at all. There’s no encouragement to read the text, the emphasis is far more on reading the stories of people who have been affected by serious illnesses and pleas that you sign up. A reader would almost certainly have ended up relying entirely on what the Saatchi campaign told them about the bill. As previously mentioned, the claims made for the bill are very different from the reality of the bill, so anybody relying on those claims may well not have signed up for what they thought they were signing up for. Unlike the official DoH consultation, which was measured, neutral and took the respondent through a series of questions before asking whether they thought the bill should become law, the Saatchi campaign bombarded the reader with hard sell before asking for their support. The petition page was arguably more skewed because – like all petitions – there was no possibility for the reader to say that no, they didn’t want the bill to become law, thanks very much. It’s worth emphasising: a petition can’t be a valid consultation because all a petition does is ask the reader to say yes, it’s not interested in anybody who says no. That link doesn’t go to the DoH consultation, it goes instead to the Saatchi bill team’s own website (originally saatchibill.tumblr.com/TakeAction, but it now redirects to their newer site medicalinnovation.co.uk). As a result, it was entirely possible that people could get the mistaken impression that by responding on the bill’s website or to their petition, they were responding direct to the Department of Health’s official consultation. Worse, it is likely that there would have been very many duplicates – people who signed both the petition and the Saatchi web form. If I had been a supporter, I would have done so. There is no indication that these are two different aspects of the same process, so no apparent reason why you shouldn’t sign both. I would contend that these factors are likely to skew the responses made via the “Saatchi” routes compared with those via the DoH. By the end of this article, I would hope to have demonstrated whether this genuinely is the case. The consultation closed on 25th April 2014 and the Department of Health set about examining the responses they had received. Now, there seems to me to be no good reason why one would go to all the effort of having a consultation and then not wait for its results to be publicly available. But Lord Saatchi didn’t want to wait. He issued a new draft of the bill and moved right ahead with introducing it in the House of Lords. This was accompanied by a 52 page briefing note that described the results of the consultation. I’ll pause to let that sink in: the Department of Health hadn’t finished analysing the consultation responses (and wouldn’t for another two months) yet here was Saatchi submitting to the Lords a document purporting to be an analysis of what it contained. 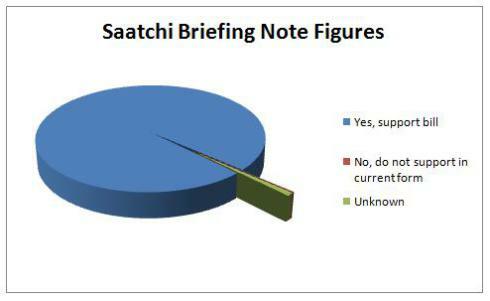 So according to Saatchi’s briefing note, the vast majority of responses were positive. They don’t distinguish between petition and website responses, but the later DoH report clarifies that the split was approximately 16000 from the petition and 2000 from the website. Of course, petition readers can’t register an opposing vote, and we’ve already noted that they were unlikely to have seen the bill, but we’ll pass by that, having already discussed it. We then see the first and only mention of the official consultation, and learn that there were 170 responses via that method. This is effectively the last we hear of the official DoH consultation. Despite not being on the Department of Health’s list of ways to respond, the bill team’s additional website and petition are described here by the Saatchi team almost as if they were the chief part of the consultation. The wording is interesting. The mention of “Medical Innovation Bill team official consultation channels” makes it sound official, but stops short of an outright claim that they were part of the official DoH consultation. But by then adding the 170 DoH responses, there appears the two would appear to become conflated. It would appear, from reading this document in isolation, that support for the bill was overwhelming and opposition was very much a tiny minority. I’ll return to this later, but will note at this stage that while no opposing organisation is named or quoted, a number of pages are devoted to cherry-picked supportive quotes from individuals. …which does not actually say anything about the bill (or the need for the bill) at all. That does look pretty overwhelmingly positive. There’s something else in the text that I found interesting. In their briefing and in the Telegraph, the Saatchi Bill team rely on that figure of 18535 responses to support their claim that support was overwhelming, that the bill has struck a nerve, by having a level of response much higher than would normally have been expected. At the outset, the DoH team stated that a good response would be anything over 600 responses. But the actual number of responses was 170. Saatchi’s briefing throws in their petition and web site responses to bulk out the numbers, but this is not a valid thing to do because the DoH team can’t have had those in mind when they gave Saatchi the 600 figure. Remember, those response methods didn’t exist when the consultation was launched and weren’t mentioned in the DoH’s document, so they shouldn’t be included. So this is the point we have reached. 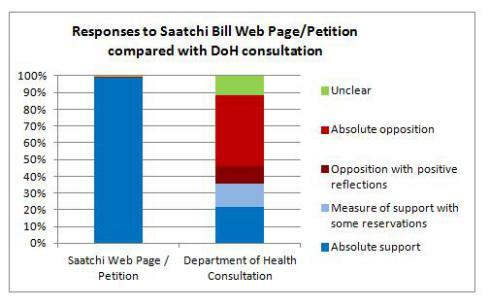 If my claim is correct, my claim that the campaign and how it was run has skewed the responses given to the consultation, then we should see a difference between the responses given via the Saatchi site and those given via the DoH site. It is also clear from reading through the text, though no outright numbers are given, that there was a great deal of considered opposition to the bill. A subsequent FoI request has revealed both the numbers and the broad composition of the responses. So let’s take a look. Immediately we can see that more than half the respondents actually opposed the bill. Only 22% gave unqualified support. Contrast this with Lord Saatchi’s briefing, which claimed 99% support and less than 1% opposition. So, despite claims by the Saatchi bill team that there was widespread support from doctors, patients and organisations, what we see from the official consultation is that no doctors gave the bill their absolute support, only 7% of organisations, and only about a fifth of legal or other respondents. Support came predominately from individual patients, carers and relatives. While it’s important to take these into account, absolute supporters from this group represented only 10% of the responses, and weighed against these individual responses are organisations representing tens of thousands of members. To contrast, I’ll put a list of the organisations that were categorised by the DoH as being opposed at the end of this article, so you can judge for yourself whether the opposition was fairly described. This is the effect of PR in action, red in tooth and claw. As the Department of Health’s consultation report commented, much publicity was given to misleading statements made in support of the bill, and this arguably undermined the consultation. There were other problems. The bill team consistently failed to respond to questions during the consultation period, about how they were using the data they were gathering, or to explain what they meant when they announced figures for how people had responded. I think this matters. If a group of people consistently and repeatedly release incorrect information, if they don’t correct errors that are pointed out to them, if they fail to answer questions about their methods, it is right to question whether they are responsible gatekeepers of the data they are gathering. Submissions were sent directly and simultaneously to the DoH official email and the Saatchi team database without any interference from the Bill team. The web form was embedded on our own website, The Telegraph online and was hosted on the website of numerous patient groups, rare disease charities and supportive individuals. Lord Saatchi’s team provided the comments that had been collected [by the petition and web form] to DH at the end of the consultation. …it makes clear that the process wasn’t instantaneous, and that the bill team held the data before handing it on. I think it’s fair to question the integrity of the process. But the bill team ain’t talking. When I wrote about my concerns regarding the consultation in my guest blog post for the Guardian, they didn’t make any public attempt to put right their lack of response to questions or to engage in a discussion; instead they asked the Guardian to remove those comments. To me, this seems seriously misleading, and not just the puffing up of the numbers from what we have previously seen. I have e-mailed the bill team (on both their e-mail addresses) and also Dominic Nutt, the bill’s campaign director, to query the apparent error and ask if they will be issuing a correction. I have not received a reply. I recommend reading the rest of Lord Saatchi’s submission and deciding for yourself if you think the claims being made accurately reflect reality. No wonder the bill’s promoters didn’t wait for the DoH analysis to be published, or to make any more than scant mention of it – it would have been poison to the bill. It would have shown that opposition was much stronger than their briefing notes would seem to imply, and that on the negative side were some very large, heavyweight organisations. Respondents were four times more likely to give unqualified support to the bill if they had read the Saatchi bill spin than if they went to the DoH website and read the bill itself. You may have thought that how the bill was presented to people wouldn’t make much difference to their opinions of it or whether they supported it. You may have thought that people don’t fool easily. I hope I have shown you here how much effect the spin has had and therefore – since the spin has been based on erroneous claims – how it has undermined the consultation process. 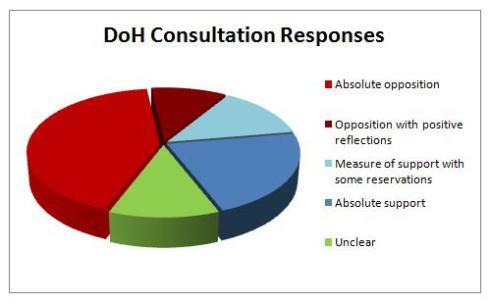 The majority of people and organisations who responded to the DoH consultation, via the route the DoH originally intended, have opposed it. Inject the spin and make it harder to read the bill itself, and the situation is reversed. This is how advertising works. Terry Pratchett talks about “selling the sizzle, not the sausage” – how the presentation of your goods can create the demand for them, how salesmen can push the idea of something even if the reality is sadly lacking. Unfortunately, in this case, we’ve now seen how badly the sausage was made. One final thought: an interesting theme has emerged here. The process of consultation an innovating doctor goes through in order to be protected by the bill is lackadaisical. As we’ve seen in this article, so was the Saatchi Bill team’s approach to the government consultation that should have informed the design of the bill. It’s almost as if they don’t understand what consultation is for, that it should be more than a rubber-stamping, arse-covering exercise, where you nod and vaguely give the impression of listening, while at the same time going ahead with whatever you were planning to do anyway. But Saatchi’s not for turning. UPDATE 3rd February 2015: Just when you though you’d got to the end of this saga, the Saatchi team have responded to this piece. I have detailed their response, and further concerns about the consultation, here.